Sotheby’s will offer the Donnersmarck Diamonds one of the most famous 19th-century courtesans in Paris, at its Magnificent and Noble Jewels auction in Geneva next month. 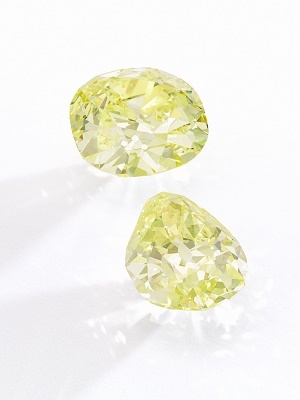 It was estimated at $9 million (CHF 8.8 million) to $14 million (CHF 13.7 million), the pair of fancy intense yellow diamonds consists of a cushion-shaped diamond weighing 102.54 carats, and a pear-shaped, 82.47-carat diamond. The stones will be offered as a single lot at the sale taking place at the Mandarin Oriental on November 15, Rapaport wrote in a press release. “The diamonds’ one-time owner La Païva, Countess Henckel von Donnersmarck, rose from modest circumstances in her native Russia to the European aristocracy. Born Esther Lachmann in 1819, she arrived in Paris at age 18 and was introduced to cultural and artistic circles by her lover, composer and pianist, Henri Herz. In the late 1840s, she met the Portuguese Marquis Albino Francisco de Araújo de Païva. After their marriage in 1851, which lasted only one day, she became known as La Païva. She met Count Guido Henckel von Donnersmarck, a Prussian industrialist and mining magnate, shortly afterward. Their relationship was the talk of Paris high society and they were married in 1871. In 1855, La Païva purchased a plot on the Champs Elysées: L’Hôtel de La Païva became one of the most lavish mansions ever built on the avenue. Among its features is a central staircase made of Algerian yellow marble, which matched the yellow of the Donnersmarck diamonds.” wrote Rapaport. “These stunning diamonds carry with them a fascinating story, full of romance and determination over adversity, which could have inspired some of the greatest novels and operas,” said David Bennett, chairman of Sotheby’s international jewelry division. “Jewels of royal and aristocratic provenance carry with them a special sense of history and these are no exception,” Bennett said. 19.07ct Pink Diamond of French Royal Provenance set to be sold at Chrsitie’sWho is Driving Luxury Spend Growth?